This new version reflects the latest tools, technologies, tactics and other developments in the field of internet politics. It also includes photos and images from current campaigns to illustrate and illuminate each chapter. It’s by far the most comprehensive guide to using the internet for politics and advocacy available. More about the book, including a list of chapters. Thank you! If you have questions, or you absolutely cannot afford $5 USD, please contact Colin Delany. Note: You can pay with a credit card, which Paypal will process for you. IF YOU DON’T HAVE A PAYPAL ACCOUNT, USE THE “GUEST” OPTION. “How to Use the Internet to Win in 2016” is a comprehensive guide to effective online political campaigning and advocacy. This new 2016 edition is expanded, rewritten and reorganized to highlight the latest developments in the tools and tactics of online politics. The 2016 edition includes two entirely new chapters, including ten big trends to watch throughout the 2016 digital campaign. It’s also updated to reflect the latest developments in social media, digital advertising, mobile technology, online fundraising, campaign data and more. As well, it includes sections on newer political tools like Instagram and the video-streaming apps Meerkat and Periscope. Incorporating important lessons from the 2012 and 2014 U.S. elections, this book is essential for anyone running for office or trying to influence public opinion and public policy in 2016. It’s also extremely useful for individual activists, nonprofit political advocates and journalists covering political campaigns. It’s the most comprehensive guide to digital campaigning available and a must-read for anyone interested in understanding how modern politics is done. The Internet: What’s It Good For? 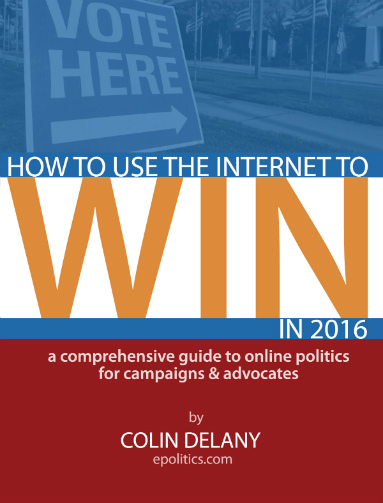 “How to Use the Internet to Win in 2016” is written by Colin Delany, an eighteen-year veteran of internet politics and advocacy, a sought-after consultant and speaker, the founder of Epolitics.com and a columnist for “Campaigns & Elections”. As a consultant, he has worked with scores of nonprofit groups, candidates and companies to help them achieve their advocacy, electoral and communications goals using digital tools. This e-book reflects his own years of experience as well as lessons learned from campaigns and advocacy organizations across the political spectrum. Delany’s previous e-books, “Learning from Obama” — the definitive guide to Barack Obama’s 2008 online campaign — and “Online Politics 101” have together been downloaded thousands of times from Epolitics.com. The site itself was named “Best Blog – National Politics” at the 2007 Politics Online Conference and received a “Victory Award” as “Blog of the Year (non-Spanish-language)” at the 2012 Poli Conference. Besides being honored as one of the “Ten Who Are Changing the World of Internet Politics” at the 2010 World E-Gov Forum in Paris, Delany has spoken at venues ranging from Harvard University and the London School of Economics to the South By Southwest Interactive conference.